Discussion in 'Site Announcements' started by sothis, Dec 29, 2018. I got back on after a while, looked at everything, WAS BLOWN AWAY. This is rad. Karin84, feinraf and Nicknames like this. LavanderGirl, Sehunnie and Nicknames like this. I remember passing by this website years ago, but this new look's got me making my own account now! Karin84 and Nicknames like this. Nicknames and Karin84 like this. please allow for the selection of a dark theme. the white is too bright to look at! The post already lists that a dark theme will be coming at some point. If it really bothers you get a night mode extension for your brower, works on EVERY website. Wow, first time I logged in after the change was on my phone split screen. I freaked out for a minute thinking I had lost my mind... Then, like a normal person I opened it in full screen and browse around read the update post immediately and found my profile page quite promptly you also got a badge the same day 4 Life on anime I forget which one it was but the skeleton so I knew that change was coming I just usually don't use my phone on the site too much so it was a moment of panic. It looks great and I love cats too and Anime. But I came to post here since this is about the updating of the page. Over the years, a few times I've probably ask the wrong person or put the question in the wrong place. Which I seem to be good at, and getting yelled at (not rudely) before I realized the Forum layout. So while you're doing the revamping how hard would it be to add a place that shows if a series or movie is in both sub format and English dubbed format? Cause it would save me tons of time if after I read the synopsis people spend so much time writing and decide I want to watch something if I knew I was going to be able to watch it dubbed. Here is why, I am 47 now and I have never needed glasses till the last few years. But I can't read subtitles anymore. I'm old no, haha LOL. I don't know how difficult it would be. But, it seems that adding it to the site from or to any new and future shows should be simple. What I don't know is how hard updating everything already here would be. I have even offered to help or do it myself but someone would have to show me how to do it first and then I will. I do rate each series I track here. I think I'm right at 630 + shows all dubbed (so I have alist to start with) and I just saw in the general discussion area the question someone posted was about good dubbed animes and trying to get somebody into anime by showing them a dubbed and my best option was to direct them to my profile page, click my anime tab, change the more filters drop down to "watched" change the "sort" Drop box to "rating" and just go down the list from my idea of what five stars down to zero stars because all my list is all dubbed except maybe for 10 shows like Dragon Ball super. I also noted that if they had a genre in mind just put it in my comments section and I could very easily throw them suggestions. Saving them from having to go through all my "watched" list. We've talked a few times over the years and I appreciate your work. I was one of the first people to welcome Fullmetal dragon, and now she runs the Welcome crew. So, I'm willing to help. I just need to be pointed in the right direction or told who to contact. https://www.anime-planet.com/anime/watch-online/dubbed/ <- Anime you can watch on Anime-Planet Dubbed via one of our partners (more info here). https://www.anime-planet.com/anime/all?en_dub=1 <- Filter for displaying what anime has a Dub in existence. This can be found via the other tab named "English Dubbed" in the main search. After months of planning, research, and iteration, we're pleased to announce the new Anime-Planet brand. Anime-Planet was created almost 20 years ago as a pet project, with an arbitrary name and frequently-changing logo. Because A-P has long since become a recognizable destination for the anime and manga community, for the past year, we've focused on creating a brand that can guide any future design changes. We chose traditional Japanese items (lucky cats, darumas, etc), patterns (origami, kimono), and colors (indigo, vermillion, etc) to highlight these themes. We wanted to find a logo that illustrated the sense of whimsy and elegance, while also having a strong tie to the name Anime-Planet. The process began with dozens of rough sketch ideas, and revisions. 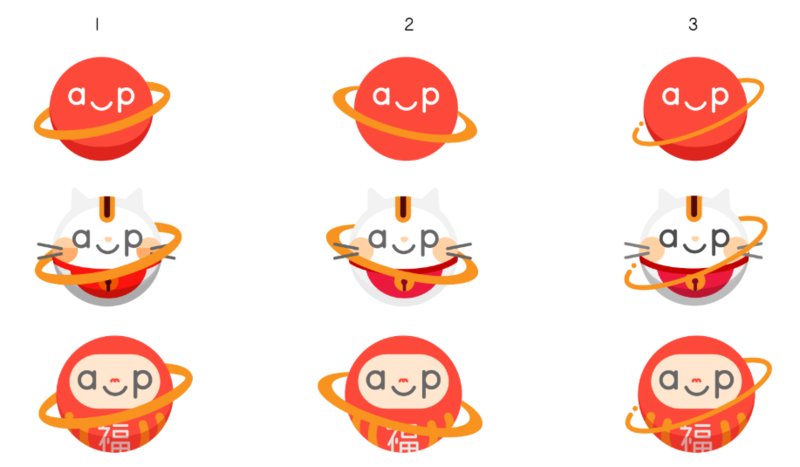 Eventually we moved towards a round planet mascot that could change into one of many other "characters", such as a daruma or lucky cat. The defining "brand" element is the "a_p" for the eyes and mouth of each mascot, which matches the font of our text logo. This planet mascot also went through many rounds of iteration, including exploring different ring styles. At this point, the brand was almost finalized, but felt like something was missing. Papercraft and origami was the solution. Our final mascots, and future images on the site such as challenge banners, have papercraft-style shadowing to further promote elegance and whimsy. An effort to fully redesign Anime-Planet.com has been underway for 6 months. As this process will take considerable effort to complete, we wanted to launch the new brand and an intermediary site update. Over the next few months, we'll continue to roll out small design changes based on the redesign, so that there isn't a huge, jarring change that will happen all at once. We hope to have the new anime information pages, which are already finalized in the design stage, up within a few months. New fonts: Muli and Oswald. New logo and header (yes, we do hope to have a dark theme available in the future sometime). New homepage and manga homepage banners. The anime, community, and characters homepages should be ready within January. New colors (indigo, vermillion, a burnt red, and [in the redesign] the old purple color). New visual upgrades that exist in the upcoming redesign (button styles, header styles, etc). New social media banners and imagery for our Facebook and Twitter accounts. Today's update is more of a skin than a redesign, so that there's a halfway point between the current content, and the upcoming redesign. For this reason there might be small things that look a bit weird, and there are still some areas that need updating, like forum styles. Badges. This will be a slow effort, but we aim to replace all badges to be in-line with the new brand. More integration of the new mascots. We'll release teasers of the redesign over the coming months, and will release small design updates along the way to make the transition easier. Thank you, as always, for your support of Anime-Planet. A-P is a fan-created and fan-run website without corporate sponsorship or ownership, so if you appreciate these updates, consider supporting the site. We're especially looking for experienced/advanced front end developers (available either as volunteers or as short-term contracts) that we can leverage to get the redesign up asap. We look forward to sharing more design updates over the coming weeks and months. So cool and amazing! The design rocks! The whole team did a great job. Looking for the updates! I think the new logo ideas are amazing! Hey thanks for those links again. Had found them at one point in the past the last 4 and a half years, and then had problems with watching the Dubs online through A-P. I still had the same problem since reading your reply and believe it to be because I'm using a Fire tablet and Samsung Galaxy phone to do most of my Online work now. I just happened to come in and borrow my mothers laptop and open the page, used your link and notice that when I used the Chrome browser (which it seems on an Android phone and Amazon fire tablet Don't allow flash anymore so couldn't watch online through Crunchyroll or Hulu) For your website that when I use my Chrome browser on the PC an 'anime planet' notification popped up asking if I would allow A-P to play flash . Naturales since I'm trying to resolve this issue for myself I said yes . Randomly picking 'my hero academia 3' first . It played the show But in Japanese with subtitles and no options for playing the dubbed version . So I checked a few more and at this point Chrome decided I needed to update my flash on the PC which I did . (But I also put a link hidden in my bio to the Anime planet English dubbed page list for my future use) . So I'll never lose it again. As for why even after selecting View online From AP's site And clicking dub online, that I'm still getting them as subbed I'm not sure of just yet After I send this I will go back and test more shows than the ones that I did test and let you know more. However, to watch English dubbed online and following the directions given above My first result was getting episode one of season 3 of my hero academia In Japanese subtitles My second experience was a black screen With it, on the side was a Spam advertisement on the side Said open now blah blah I skipped it but right clicked on the player itself and went to Adobe Flash Web page and did an update for my Chrome version on this PC . And then like I said I saved The dubbed Page link From the search bar after I realized that English filters Is listed in the 'others 'category. So for the last 4 and a half years I have used the search but never new the filter was there to take me to the page directly. But the end result is that my request that started this has been taking care of the bugs and issues with Android versus Amazon versus PC browsers. And using the website to list and give star ratings to 638 dubbed animes on Anime-planet.com. I would much rather 'click here to watch online' to view online anime through your partners. This is something I will continue to look into . And posting a bugfix in the proper place Provided I can find one considering I seem to be very un-adept at locating the locations of things I like on this page or love about this page But thanks again for the links above. I know many people that have asked me about it in the past. Now I can pass the knowledge on to them as the URL is saved to my profile page. No but really, massive hype. Letsa go. Omg... what...? It's... nice. But woah. Nicknames and thor123 like this. Nicknames and commonxreaction like this.